Last night, on February 1, 2017, Crown Princess Mary attended the 2017 Danish Swimming Award ceremony at the Circus Building (Cirkusbygningen) in Copenhagen, Denmark. 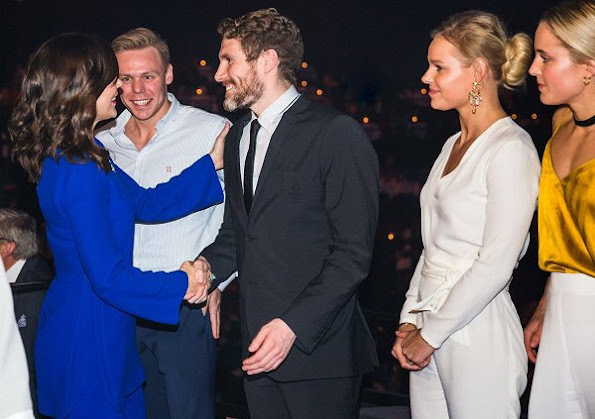 The Crown Princess has been patron of the Danish Swimming Union since November 2006. 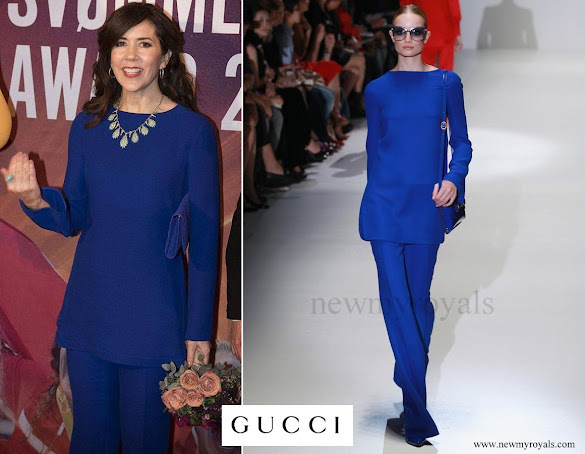 Princess Mary wore Gucci Electric Blue Pantsuit. i dont like the hairstyle. the top looks a bit too long. But the color is beautiful ! and it looks great on her. I don't like the hairstyle. It's not flattering to her. I rather like the suit - very subdued for Gucci. And the necklace is great. The necklace gives it some "complexity" so it would be plane. I love everything about this look. Hairstyle is nice and fresh and that colour on her is gorgeous. Very good look. Love the color and her hair. Mary is awesome. When I look at Mary, then for some reason I started to think of Smurfs. Its not bad outfit [for Gucci] BUT its way too blue. Perhaps different accessories would have worked better with this electric blue outfit. I also don't like her curly hairstyle because its oldfashioned and makes her look older. She experiments with her style here and I think that's great, she was maybe to much on a "safe side" for some time now. It's not very good look yet but common Mary try again you're not to old to be a little more bold in your choices. 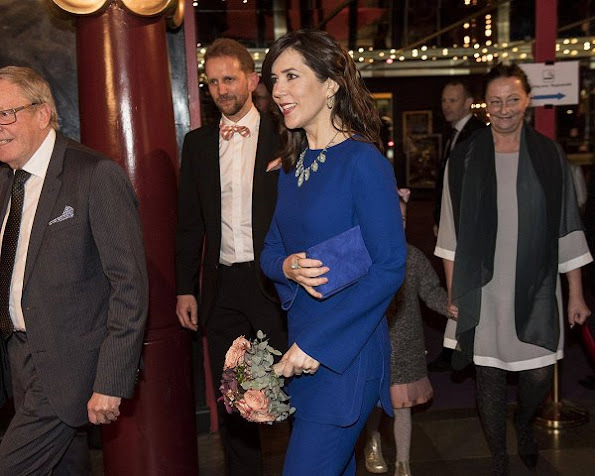 I dont like that color of blue as they call it electric blue but Princess Mary looks nice in that color. Wrong hair style for her. No me gusta el peinado ni el traje, pero el color es bonito y el collar espectacular. 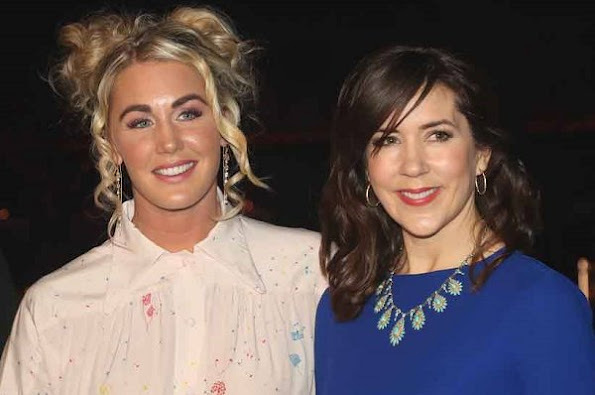 She looks much younger than duchess Kate!! I do not like this style, not pant dress nor hair. Is this necklace on loan from the Queen or costume jewelry? I like this look although it is a shocking departure from her norm! Go Mary, and the edgier side of you!!! Love this outfit, this colour looks beautiful on Mary. Not so keen on the necklace or the hairstyle, although I like the colour. I love her necklace! The blue is gorgeous. So bright. I actually like the whole outfit. Very simple, but the startling blue color is wonderful on her. Denmark is highest in the 'happy living chart'; this looks quite a good advert to me! 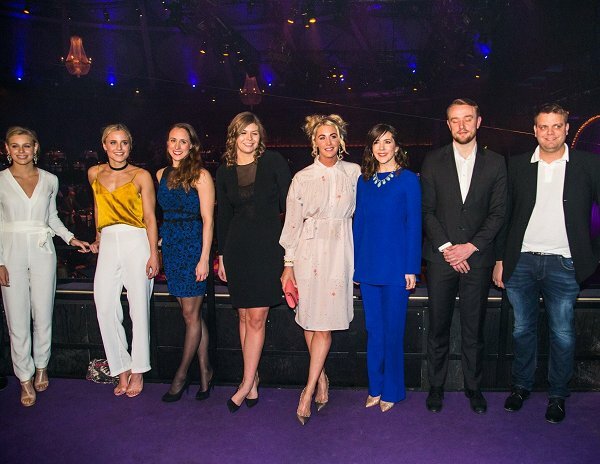 Love Mary's hair style n color, and what a line up of athletes she is with! Toll, toll, toll! Wow, diese Farbe - edel und so passend, um die SchwimmerInnen zu ehren! Der Anzug ist ein Winner: das Oberteil mit leichtem U-Boot-Ausschnitt, angedeuteter A-Form mit Seitenschlitzen, in einer guten Länge und leichten Trompetenärmel plus die Hose in einem moderaten Marlene- oder Flared Stil sind eine Kombination, die vielen Frauen hervorragend steht. Man ist damit immer gut angezogen und kann sie vielseitig einsetzen. Die einzelnen Teile lassen sich auch gut mit anderen Sachen kombinieren. 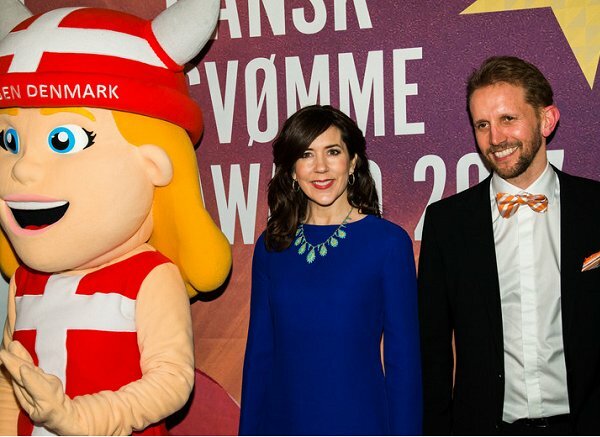 Eine Kunst, die Mary hervorragend versteht. Sehr schön ist auch die 'indisch/orientalisch' inspirierte Kette, die, ich muss es immer wieder bewundernd feststellen, in der Länge genau zum Oberteil passt! 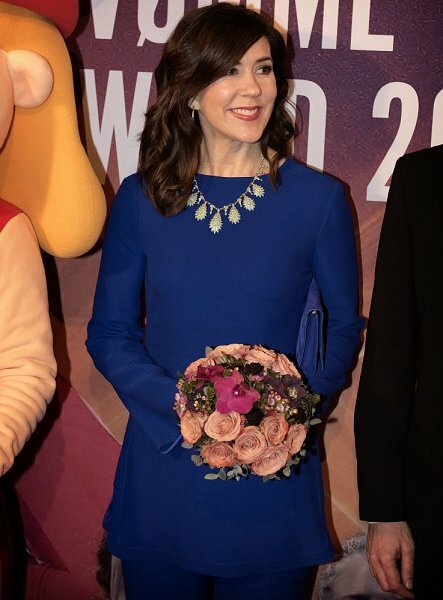 Kaum zu erkennen ist ein Statement-Ring am Zeigefinger der Kronprinzessin. Auch das ein Hingucker. 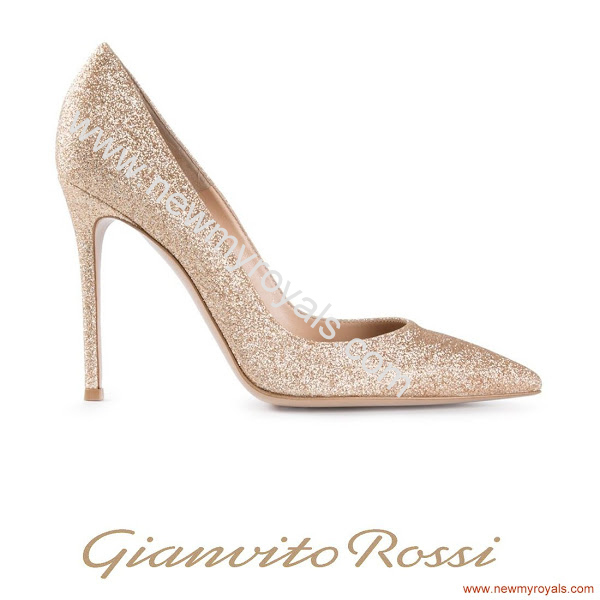 Über die tollen Schuhe braucht man gar kein Wort mehr zu verlieren. Ich finde dieses Outfit atemberaubend.